Doves Children’s Home is located in Tachileik, Myanmar housing children in poverty. As it is built beside the river bank, the children’s quarter is often bombarded by the flooding water during the April to September rainy months. Teachers use different kinds of method to protect Doves Hostels from damage of flooding on the river embankment but in vain. 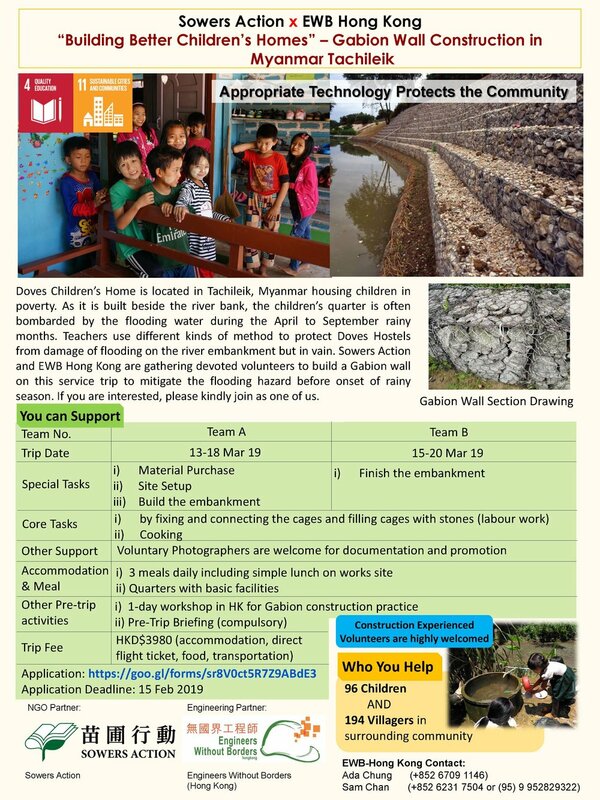 Sowers Action and EWB Hong Kong are gathering devoted volunteers to build a Gabion wall on this service trip to mitigate the flooding hazard before onset of rainy season. If you are interested, please kindly join as one of us. Waste Management for our Sustainable Community and Improving our living environment on land and below water. We are developing this Taskforce team for buildup professional pools to identify the risk and challenges faced by the disadvantaged communities in HK and Overseas, helping on waste management awareness education and professional advisory services on waste management and recycling to develop a resilient and sustainable society. To Support the development of our engineering-based social services projects for the disadvantaged communities in Hong Kong and South East Asia, we are planning to set up a taskforce relating to waste management. We are now looking for pro bono professionals as our volunteers. It’s the most wonderful time of the year! The Christmas is coming, coming and coming. Share your day and joy with us this year by hosting an unforgettable Christmas party. 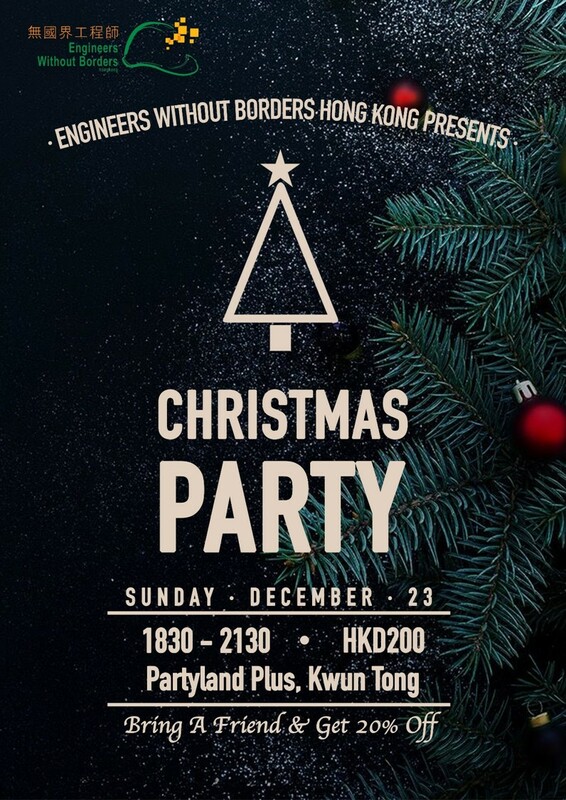 You are cordially invited to an evening of Christmas celebration dinner. New friends are also welcome to know more about us. We have carried out social service project in Hong Kong and overseas and our passionate volunteers take part on project coordination and engineering design. We care our service, we also care about walking with our HK and overseas projects partner. Let’s empower to run our projects on time, within budget and achieve objectives & goals together. We are keen to create better learning environment and long-term education impact to Myanmar. We organize a technical book donation event lasting for two school semesters in university such that university students can donate the second-handed books to us and then we will transfer it to Library of Myanmar Engineering Society in Yangon. The year 2018 marks our big growth to EWB-Hong Kong on Hong Kong Projects and Overseas Projects. We would like to invite you to brainstorm new idea for our future projects and service quality improvement. Your innovative idea will bring synergy and positive energy to us. Let's focus to our roadmap to 2019. The project planning workflows were illustrated by two potential projects in Myanmar:. one is community upgrading in urban slum, another one is improvement works in a campus of children center. They shall form the project teams. The detailed recruitment will be announced soon. We NEED pro bono project team members. We joined Young Engineers Forum organized by our myanmar local engineering supportor with local engineering students and young engineers in Mandalay on 18-19 August 2018 including careers seminar, technical visit to hydropower plant and cultural exchange session. We finished investigation trip to Tachileik children center for engineering-based, social and environment survey. Engineering Inspection (Structural, Water, Ventilation) and feasibility study on flooding mitigation. We celebrated the 1st anniversary of the Hong Kong Projects Committee and the establishment of the Overseas Projects Committee on 3 June 2018. We also invited a guest speaker to share her experience on the topic of "Humanity“. We had organized meaningful game to let volunteers put down ourselves and buildup teamwork and communication together. We finished a fruitful trip to London in late March. It kick-started our communication with British Engineers, Academics and Humanitarian Organizations. We foresaw the need to create more synergy together. We visited EWB-UK and EWB-Oxford Student chapter to understand their humanitarian engineering story. We shared our idea to engineer the future and co-create a big family in EWB. Furthermore, we kept our communication to Royal Academy of Engineering after attending EWB International Forum last August, we shared our story to Myanmar. Citizenship Programme to draw the awareness of future generations in tackling global challenges. We finished exploration trip to Myanmar Chin state and Sagaing Region to understand the local need on flooding mitigation, Bridge construction improvement, water & electricity scarcity.